2,241 video and map projects completed. Server status: IDLE. 0 in queue. When I first started playing Elite Dangerous, I knew that my eventual goal would be to explore deep space. While I've spent more time inside the human-occupied "bubble" than not, it has always been with an eye toward getting back out "into the black", building up money, ships, and standing with the engineers to fund and supply those expeditions. Along the way, I discovered how complex and non-intuitive aspects of the game can be. I could have saved myself a lot of time and difficulty if I knew more right from the start, but the learning experience is worthwhile too, and for all the years of gaming that I've done, I'm usually pretty quick to pick up a game's mechanics and specifics fairly quickly. Having said that, I've tried to compile some tips and information that a new aspiring Explorer might find useful. 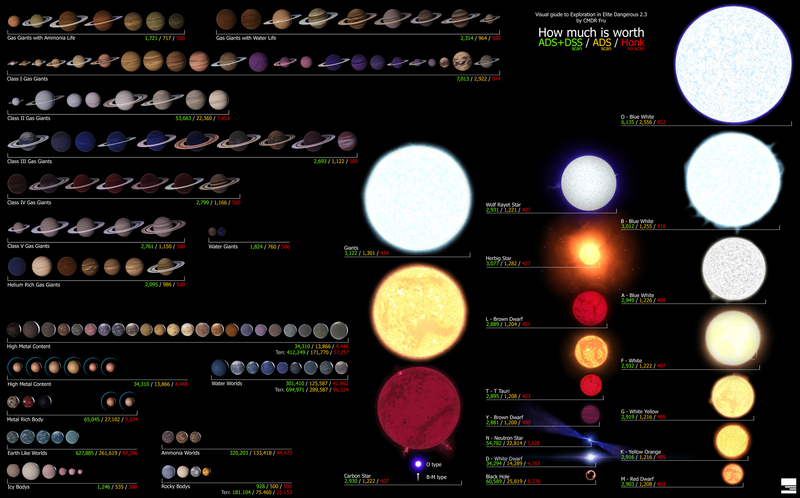 Some of this is exploration specific, and a lot of it is also general to Elite: Dangerous. This probably goes into a lot more detail than you are prepared for, so you may need to revisit this page more than once. Likewise, even seasoned veteran explorers can miss a variety of details, and therefore may find this page useful too. In fact, I'm sure I've missed some things, and I'm still picking up new things even after 1.5 million lightyears! And so I will add more as time goes on. When you have nothing, a quick way to get some money is to run data-courier missions. They have no cargo, so won't attract pirates or require space in your ship (However it should be noted that the data missions can include enemies being sent after you, so be sure to check, or otherwise be prepared to evade). Once you can carry 32-96 tons (Cobra MkIII, Type-6, Asp Explorer, etc), a good way to make reliable money is by doing a trade-route with rare goods. Alternately, once you can afford to buy and equip a Dolphin (or larger) ship with passenger cabins, the passenger missions from Robigo to Sirius Atmospherics will also generate a lot of reliable income to get you started. Exploration is always a reliable source of money, also requiring no cargo space. Scanning Earth-Like Worlds, Ammonia Worlds, and Water Worlds will always be worth your time. Don't be afraid to start here instead of doing the above! But you might enjoy the experience more if you do some basic money earning while learning to fly, and then equip for exploration. Not everything you might want for your ship is available in one place (with a few exceptions), and not always at the same price. Ray Gateway in the Diaguandri system has most of the module types in the game, and at 15% off, but has a few gaps. High-Tech systems with high populations generally have the better gear, including A-rated modules. Once you reach Elite in any category, you gain access to Jameson Memorial in the Shinrarta Dezhra (Founder's World) system, which has everything, and at 10% off the regular price. If you sell a ship, you'll only gain back around 85% of what you paid for it. However you can buy and sell modules as much as you want. You will always sell the module for the same price that you actually paid for it (no loss). You can find userful infographics online to help you out. In general "exploration" can mean a lot of different things, to a lot of different people. There's no right or wrong way to explore. Some people prefer a more tourist approach, visiting well known objects in space. Others prefer to find rare combniations of planets or stars. Some enjoy finding the furthest or most extreme locations. Others just want to see things that no one else has visited before. It is entirely up to you. The most basic aspects of exploration are traveling, and collecting cartographic data. "Explored" or "Unexplored" refers to whether you have personally conducted a scan on an object. "Explored" means that it is showing up in the map, complete with its name visible. Using the Full Spectrum Scanner (FSS), or the close-range passive detection, results in objects being "discovered" (or "tagged"), providing you with data you can sell to Universal Cartographics at a station. In the player community, this often refers to whether anyone has done the FSS scan before, whether it was you or someone else who previously visited, and then sold the data to Universal Cartographics. An object is not considered "Discovered" until someone sells the scan data at a base. The first person to sell the data will get their name associated with the discovery. Often referred to as "tagging". This requires performing a scan with the FSS (Full Spectrum Scanner). As of E:D version 3.3, the Discovery Scanner is built into all ships by default. This performs the "honk" (as it is known in the community) that will scan and tag all star-class bodies in the system, and it also primes the FSS (Full Spectrum Scanner) with gravitational information, so that you can proceed to use it to scan and tag the planetary bodies. As of E:D version 3.3, the FSS (Full Spectrum Scanner) is also built into all ships, be default. This is the "telescope" scanner mode that you will use to scan and tag all planetary bodies in a star system, as well as find artificial signal sources in space, as well as natural ones including "Notable Stellar Phenomena" (usually Lagrange Clouds). Instead of using the FSS (Full Spectrum Scanner), alternately you can fly close to planetary bodies (approximately 30 light seconds), and your ship will automatically scan and tag them. Objects will not show up in the system map until they have been scanned by one of the above methods. You will probably want to bring a Detailed Surface Scanner, which allows you to fire probes at a planet, potentially gaining a "First mapped by" tag, and revealing any Points of Interest on the surface, if there are any. All objects have an "exclusion zone", usually displayed as a green circle around the object (with orbit lines turned on), which displays when you are close to (or on a) collision course with it. You will want to avoid hitting this region, because it will cause an emergency stop, and damage your ship. In the case of stars, your ship may overheat when attempting to return to supercruise, or hyperjump. When hovering the cursor over stars in the Galaxy Map, it will list the primary/secondary stars only, and not any that are orbiting as children of other stars. That is, it shows the stars that will be stacked on the left side of the system map, and not the ones that will be shown horizontally across the map. Once you've visited the system, all of the stars will then show in the galaxy map's list. Throttle down during hyperspace. Start scan of primary star, "honk", and then look at the system map and/or navigation panel while scan completes. If there is nothing interesting, start fuel scooping, and then jump to the next system. Safer, slower, more deliberate, and scans/tags each primary star. Remain throttled up during hyperspace. As soon as you enter the star system, aim your ship to pass through the scooping zone of the star, on a path that will miss the exclusion zone. Perform a honk, and then look at the system map while the scooping completes. You may have to use half-throttle if your scoop isn't fast enough, or you didn't fill up on the previous jump. If there is nothing of interest on the map, wait until the star's icon on the radar turns back to orange (instead of red), and start the jump sequence as you exit the scooping zone. This method is faster, because it does not take the time to scan and tag the entry star. This method is sometimes referred to as "jonking", short for "jumping and honking". For both methods, what constitutes "something interesting" to scan or investigate will vary considerably, between your interests, how fast you're trying to reach a destination, how much money you're trying to make, and more. Scanning strategies are potentially an entire discussion in itself. Different types of bodies have wildly different monetary values, as scan targets. There are some useful infographics that can give you an idea of the values (with highly variable payouts) here and here. 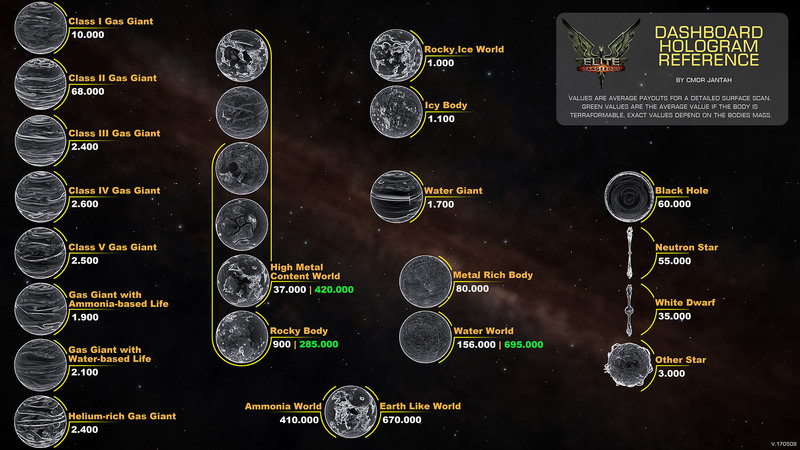 The actual monetary values have changed in E:D 3.3, and the numbers shown in those images do not take into account the current multipliers for first discoveries, mapping, etc, and therefore should only be used to get a general idea of which ones are more valuable than others. Ammonia Worlds, and terraformable "High Metal Content" worlds. Non-terraformable Water Worlds, and terraformable Rocky Bodies. Black Holes, Neutron Stars, "Metal Rich" bodies, and Class-II Gas Giants. White Dwarfs, and non-terraformable High Metal Content worlds. Everything else (stars, ice worlds, other gas giants, and non-terraformable rocky bodies). When approved for docking, the small targeting radar on the left of the main radar will point toward your designated pad. If you get stuck in the "mail slot" or on other structures, you can sometimes break free by deploying and retracting the landing gear. Your ship is most maneuverable at 50% to 66% speed. If you accidentally pass the "7 seconds" mark when approaching something, there are a few ways to slow down. Aim to pass by the target as closely as possible without hitting it. The deeper gravity well will slow you down more. If the target was a moon of a larger planet, you can use the larger planet to slow you down more. You can also "corkscrew" toward your target, to travel a longer path and give you more time to slow down. Sometimes this will save you from overshooting, and other times it will just buy you enough time to complete a scan. You can spiral toward the target by rolling to one side and yawing to the opposite side. This works better in smaller, more nible ships. Space stations always (generally) face toward their planet. The entrance is somewhere on the planet's side of the station. The more weight you can shave off of your ship, the longer your jump range will be. Fuel consumption per jump is on an exponential curve. Shorter distance jumps (compared to your ship's maximum jump range) will use considerably less fuel. In fact, "economic" routing in the galaxy map can allow you to travel a lot further on one fuel tank, than with "fastest" travel. The stars that can be scooped for fuel are only the "main sequence" star classes that are fusing hydrogen at their cores. In astronomy terms, these are class O,B,A,F,G,K,M (rememberd as "Oh be a fine guy/girl, kiss me"). Many players will rearrange this and find it easier to remember as "KGB FOAM". Even easier, they're the first seven options on the "star class" filter in the galaxy map. One virtue of the traditional "kiss me" mnemonic, is that it gives you the order from hottest to coldest. Generally it is more favorable to rely on fuel scooping, rather than installing extra fuel tanks. Most of the time the extra fuel just weighs you down, and will only be useful for jumping through sparse regions with mostly non-scoopable stars. Only pack extra fuel if you plan to explore such a region. Extra fuel is only mildly useful for neutron boosting in the "Neutron Highway" regions, in that it will let you do more consecutive boosted jumps. The "Neutron Highway" or "Neutron Fields" can be used for getting around the map quickly. These terms refer to the layers of neutron stars that are about 1,000 lightyears above and below the galactic plane, in the core region and inside the spiral arms (but not the arm gaps). Neutron Boosting is in no way required. It allows you to get around the galaxy quickly, but for many explorers, it's what you see along the way that is more important. It will depend on your goals and exploration strategy. If you aren't comfortable with neutron boosting, make sure to practice when you don't have valuable data on board, and are close to your respawn point. While technically dangerous, it's entirely possible to boost safely and repeatedly, once you know how. 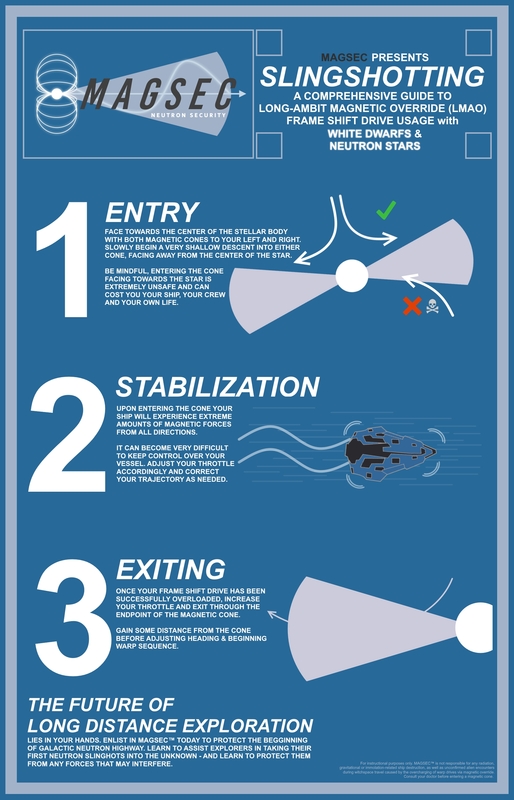 The neutron star will quadruple the jump distance of your ship for a single jump. This is a useful infographic that explains how to safely boost. Some video examples of neutron travel: Asp Explorer, Python, Anaconda. The galactic map has an option to enable boosted jumps in the route plotting, when you select fastest routing, not economical. It is best to filter out White Dwarfs when using the map filter. They can also supercharge your FSD, but they only give you a 50% range boost for that jump, and the ejection cones of the star are very small compared to the star's exclusion zone, making it dificult to use safely. An alternative to filtering out White Dwarfs is to either use an FSD Injection instead (jumponium), or otherwise perform a non-boosted manual jump in the correct direction, and then let the Galaxy Map re-plot the route. Every FSD "boost" (or "supercharge") will damage your FSD, usually around 0.5% to 1% per boost. Since the FSD begins to malfunction as soon as its health drops below 80%, it is considered mandatory to bring a repair unit (AFMU) with you, if you are going to travel this way. Don't forget to go into advanced maintenance occasionally and repair your hull and paint. These both wear down over time, mostly in supercruise. Don't worry too much though, because 0% integrity on the hull just means that your hull strength is about 70% of its maximum. Dropping to 0% integrity will not kill you (whereas 0% hull will kill you). A,C,E modules are the "standard" mass modules, with B being the heaviest, and D being the lightest (+/- 60%). A = Most expensive, highest performance, and in some cases the coolest heat. B = Most durable, heaviest. C = Average capability, average cost, sometimes considered "best value". D = Lightest, least durable, relatively cheap. E = Cheapest, worst performance. There are rarely any times that you will want to equip anything other than A or D modules. The exceptions are for massless modules (AFMU or Fuel Scoops), where you will be limited more by cost, and the mass doesn't factor in. Otherwise, "A" for performance or "D" for light mass are usually the best choices. Weapons and utilities follow different rules for the letter ratings. For weapons, all that matters is the size-number, and the type (fixed, gimbal, or turret). The letter-rating is derived from a combination of those two. Utilities often only have one variant. If there are more than one, it may affect power-usage and range, rather than mass or performance. Your heat in supercruise is almost entirely determined by the amount of power you're currently drawing from your power plant, and its heat rating, with some base efficiency from the ship's hull thrown in. Size of the power plant doesn't matter for heat. A-rated runs coolest, and you can turn off systems you're not using, in order to reduce the heat it generates. AFMU (use a lot of power, and you don't want to repair while moving, to avoid accidentally causing an emergency stop). Shields (only useful when landing, but also easy to forget to turn back on, so this is debatable). Power Distributor (when turned off, your power systems function normally, except that you can't change the power settings/pips). Vehicle Hangar (only needed when deploying the SRV). Cargo scoop (only needed when scooping cargo, or using collector limpets, etc). Dirty Drives is frequently the better modification, over Clean Tuning, unless you're specifically trying to reduce your heat output in combat situations, or for maneuvering over the surface of hot planets (for instance, the Type-7 has more heat issues on planets than many other ships, so Clean might be preferable here). The thrusters only generate heat on their own when in normal space, not supercruise. So unless you're having heat problems in combat or while landing, you can usually run Dirty Drives for more thruster performance, and it will have zero impact on your supercruise heat. Personally, I find that Dirty works well on ships that run particularly cool, or are at least average, such as the AspX, DBX, Python, and Anaconda. I have started to prefer Clean on the transports, such as the Type-6 and Type-7. Clean Tuning on your thrusters is still viable however. If you want to ensure that you rarely (or never) have issues with overheating when exploring hot planets, and can jump out safely, then Clean Tuning is the way to go. Using Clean Tuning with the "Drag Drives" experimental effect will give you a level of performance that is roughly half-way between Clean and Dirty, at the cost of some of the heat savings, but will still run a lot cooler than stock thrusters. Shields are sometimes considered "optional", but this advice mostly comes from a time before planetary landings were possible. Without shields, it's difficult to land without doing some minor damage to the hull, until you have gotten good at soft landings. So it's often considered a "must-have" if you also have the SRV Hangar installed. Choosing to explore without shields is still viable, particularly with repair limpets. However, forgoing the shield should be considered "advanced" rather than "beginner", if you plan to land on planets. The AFMU (repair unit) is useful to have in most exploration builds. It's technically optional, but becomes a necessity if you do any neutron-star boosting, since that will damage your FSD each time. AFMUs are massless, so equipping more than one is useful in order to have more repair "ammo", plus you can repair faster if you have enough power to run more than one of them simultaneously. Two AFMUs can also repair each other, however this is less important since they can operate normally all the way down to 1% health, and if they reach 0%, you can still reboot the ship to get them working again. Your limiting factor when exploring with damage is that the Power Plant cannot be repaired in the field at all, since it would have to be turned off, and your AFMUs need power. The AFMU's priority is to keep your FSD repaired, since the FSD will begin to malfunction as soon as its health drops below 80%. You will of course also want to keep other critical systems running, such as the canopy and life support, but the FSD needs to stay in a high state of repair. The power plant only takes damage from emergency stops from supercruise. If you can avoid hitting star/planet exclusion zones, or dropping out of supercruise accidentally from other causes, you can keep exploring longer, since E-stops are the only way to damage the power plant, which is also the only module that can't be repaired in the field. Emergency stop damage causes a flat percentage of damage to your modules, based on health remaining. This means "integrity" mods on your modules have no impact on E-stop damage, and the damage amounts will get smaller as the modules get more damaged. Heat damage begins at 100% heat, but only to modules at first. Hull damage begins at 150% heat. All non-hull heat damage can be repaired with an AFMU, since the power plant is immune to heat damage. If you have an AFMU on board, technically a heat-sink isn't necessary until you approach 150% heat, since module damage can be repaired with the AFMU. If you also have repair limpets, you may not need heatsinks. In the right-side panel, you can power off systems that aren't in use. You will never need to run the AFMU at the same time as your thrusters or FSD, for instance. Always drop out of supercruise before repairing, or you may cause more damage. In the same right-side panel, you can set power priorities. I recommend using priority "1" for only these: Life support, Thrusters, FSD. Those are the minimum you need to get yourself to safety. Everything else should be priority 2 or higher. I would even set the Vehicle hangar to priority 2, and nearly everything else to 3-5. The reason is that if you dismiss your ship while landed on a planet, you want to make sure that when the thrusters re-engage, a power shortage won't turn off the vehicle hangar while you're outside the ship, nor will the thrusters be disengaged with the ship above ground. An optional recommendation is to make sure that the "priority 1" modules (life support, thrusters, and FSD) can run within 40% of your power plant's total power supply. In the event that your power plant drops to 0% health, there is a chance that it will outright destroy you. However, if that doesn't happen, the power plant will be reduced to 40% power output. If those three critical systems can work within 40% power, you can get to safety to reboot the ship, and bring the power plant back to full power output. Usually you can avoid taking this much damage to your power plant, and 40% for those three systems usually requires installing a much larger power plant than you might want, so this is a very minor recommendation that is easily skipped. You can safely add a "heavy duty" modification to the ship's "Leightweight Alloy" hull module. It increases mass proportionately (by percentage), but the module has zero mass, and so you gain the benefit with no penalty. I need more verification on this, but it appears that additional hull strength and module integrity only helps against damage due to weapons, and not poor landings, emergency stops, or overheating. Those appear to do proportional damage (by percentage). Fly the ship you enjoy most, since you'll be using it for long stretches of time. This doesn't mean you shouldn't consider other factors, depending on your destination or method of exploration. But as a general rule, enjoyment of the ship should be a high priority. If you don't like your ship, you'll have a bad time. D-rate almost everything else (to keep the weight down). Empty slots are useless. Consider filling leftover slots with AFMUs, as they weigh nothing, and give you more repair "ammo", and also soak up additional heat damage, as damage is spread out over your modules.. Always bring a Detailed Surface Scanner. It's worth modifiying this to grade-5, as this will provide up to a 30% improved scan radius for the probes. This makes it exceptionally easy to get the efficiency bonuses when mapping planets. Bring a vehicle hangar, if your ship has the room. A 2G hangar is usually enough, since you have to be fairly reckless to lose the SRV when exploring. But a 4G gives you some redundancy by bringing two SRVs. The SRV not only gives you something else to do (drive on planetary surfaces), but is also your main way of getting materials needed for FSD boost synthesis. Usually the "G" rated hangars are better for explorers. The mass is lower, to help keep your jump range up. However, these have a higher power draw than the "H" hangars, so you will need to budget your power accordingly when sizing your power plant. Since you can turn off the hangar when not in use, this usually isn't a problem. You can explore in any ship, but there are some aspects which are worth considering. Jump range matters most in terms of how long it takes to travel from point A to point B, and will also affect how easy it is to cross gaps or sparse regions. Generally speaking, a jump range of at least 35 lightyears will be sufficient to go almost anywhere except the most remote areas, and deep into the edges of the galaxy. A range of 50 ly or more will effectively allow you to go nearly anywhere. Aside from those caveats, jump range isn't as important as you might initially think. Many explorers prefer to execute lots of shorter jumps in order to more thoroughly explore the stars they travel through. Others like to go places quickly, and then explore "over there". And in terms of earning potential, explorers are paid for scans, not by the lightyear traveled, meaning that the number of jumps is more important than the distance covered. So choosing a ship often comes down to using the ship you enjoy flying the most. You'll be out in deep space for days, weeks, or even months or years, depending on your exploration strategy, so you might as well enjoy flying your favorite ship. When you have your ship assembled, something to consider is how well it handles high gravity environments, or very hot environments. The choice between Overcharged or Low Emissions power plant mods, and Clean Tuning vs Dirty Drives can be influenced by how far into the extremes you want to go. All ships can land on high-gravity worlds. The game currently has a limit, in that landable worlds will always have less than 10 G of surface gravity. Anything above 3 G handles about the same. The reason for this is that Flight Assist cheats in your favor, allowing both the vertical and main thrusters to always provide a minimum of 5 m/s acceleration, even if they're technically too weak to do so. The same is not also true for lateral thrusters (when rolled side-to-side), or for flying upside-down (inverted), so you will want to avoid those maneuvers. Landing on high gravity worlds just requires patience, descending at shallow angles with a slow vertical drop. If you want to test your ship before leaving the bubble, a good location is Achenar 3, at 6.73 G.
Most ships are capable of overheating when trying to jump or reenter supercruise too close to a star, such as after an emergency stop in its exclusion zone. However, planets can also provide a hostile environment in much the same way, if it is a hot world, or your ship doesn't manage its heat well while on thrusters. To test the limits of your ship's heat management while you're still in the bubble, you can go to Skardee 1, which orbits within the star's scooping zone. You can pull some hard turns while flying upside-down to intentionally heat the ship up, and see what it takes to overheat your ship. Note: Most ships can overheat here. Some will overheat quite quickly, while others will require you to work at it. You will rarely land in places that are this hot while exploring, so this sets an upper-bound on expectations. I've assembled some sample configurations for many of the ships in the game, along with a "target" jump range for that configuration. Many of these jump ranges can be exceeded with a stripped-down build, however you will probably wish to sacrifice some jump range in order to add more equipment to your ship. Don't fret if your jump range is smaller than what is shown here. While they are basic builds, they also assume that you have all of the engineers unlocked and are willing to maximize each modification, as well as undersize several modules. It takes time, and resources, in order to fully optimize your ship. My suggestion is to alternate between exploring and improving your ship, so that neither activity gets stale. Hopefully this can guide your choice of the best exploration ships, to suite your taste. I favored running cooler rather than using the lightest possible power plant. Some explorers may prefer an unmodified power plant, or a mild overcharge in order to fit a smaller/lighter power plant. Most are configured to use Dirty Drives to make up for undersizing the thrusters, however Clean Tuning may be preferable on some ships due to heat when maneuvering over planetary surfaces. None of the ships are equipped with fighter hangars. All ships are equipped with: Largest possible Fuel Scoop and a Detailed Surface Scanner. Most ships have the largest fuel tank they are designed to equip, with only a few notable exceptions. However some explorers will choose to undersize the tank. All ships have a shield, as small as possible, using the Enhanced Low Power modification. All ships use a power distributor large enough to permit boosting. In most cases it relies on the Engine Focus modification. All ships use a maximum grade-5 FSD range modification with the Mass Manager experimental effect, for a +61.2% Optimized Mass. Please note that for smaller ships that use FSD size-4 or smaller, the Deep Charge experimental effect will grant a greater jump range than Mass Manager, but it also consumes more fuel and power, so I opted to keep the templates consistent and assume Mass Manager only. Ships that don't have enough slots for all three of AFMU, SRV bay, and FSD Booster, will prioritize the SRV over the FSD Booster, and leave off the AFMU entirely. This prioritizes being able to collect materials for jump boosts and give you more to do, over pure range increases, and de-prioritizes repairs and neutron boosting in favor of the other two. FSD Boosters only appear on ships with five (5) or more unrestricted slots, due to the priority rules above. AFMUs only appear on ships with six (6) or more unrestricted slots, due to the priority rules above. Repair limpets, and the associated cargo rack, are only added if the ship can combine both of those modules with AFMU, SRV, and FSD Booster. This requires the ship to have a minimum of eight (8) unrestricted slots. Click on the ships below, for Coriolis builds. Columns can be sorted. Column key is below the table. Loadout rules are described above. Note: Additional slots for April 2019 update have been added to the chart. Coriolis builds will be updated later. Slots = Number of unrestricted optional internal slots. ScoopRatio = Maximum scoop size relative to FSD size (For instance, "0" means they're equal). Higher is better. ScoopSec = Number of seconds of scooping per jump, at maximum scoop rate, assuming largest A-rated FSD and Fuel Scoops are installed. Lower is better. SC-360 = Number of seconds needed for completing a 360-degree circle in supercruise, using the pitch axis, at 50% throttle. Numbers are courtesy of marx from this thread, used with permission. Slot-Lightyears = Number of unrestricted optional slots multiplied by lightyear jump range. A simplistic measure of how much "stuff" you can bring over a given "distance". Mass Sensitivity = Change in jump-range when adding 1 ton of mass, based on the linked templates. Smaller is better, for bringing additional equipment. This sensitivity value will be reduced with each additional ton added. Lighter ships and smaller FSDs are more strongly affected by mass changes. Score = A simple calculation based on jump range, number of unrestricted optional internal slots, supercruise turn rate, scoop time per jump, and mass sensitivty. This score shouldn't be taken too seriously, since it is no substitute for more subjective aspects (such as how much you enjoy flying the ship), nor does it take into account the variety of different goals that individual explorers will have. It is at best a very crude measure of how much a ship can do. 6 Slots: Basic exploration configuration: Fuel Scoop, Shield, AFMU, SRV Hangar, FSD Booster or second AFMU, Detailed Surface Scanner. 8+ Slots: Self-reliant exploration configuration: Fuel Scoop, Shield, AFMU, SRV Hangar, FSD Booster or second AFMU, Cargo Rack, Repair Limpet Controller, Detailed Surface Scanner. Optionally, any leftover slots can be used for something else, such as a fighter hangar, cargo rack, docking computer, etc. Beyond that, leftover slots should be filled with additional AFMUs since they help absorb heat damage (cargo racks will not), and give you additional repair "ammo". This website is not an official tool for the game Elite: Dangerous and is not affiliated with Frontier Developments. All information provided is based on publicly available information and data supplied by players, and may not be entirely accurate. 'Elite', the Elite logo, the Elite: Dangerous logo, 'Frontier' and the Frontier logo are registered trademarks of Frontier Developments plc. All rights reserved. All other trademarks and copyrights are acknowledged as the property of their respective owners.